Paint Protection film is highly recommend in today’s world of soft water base paints. Protecting your Vehicle with clear bra film is the only solution to maintaining the beauty of your vehicle. We install the top three clear bra brand films: 3M Scotchgard Pro, Suntek PPF-C and Xpel Ultimate in both pre-cut and custom coverage. We also offer Xpel Stealth and Suntek Matte paint protection films. To transform your vehicle from a gloss finish to Satin Matte finish. 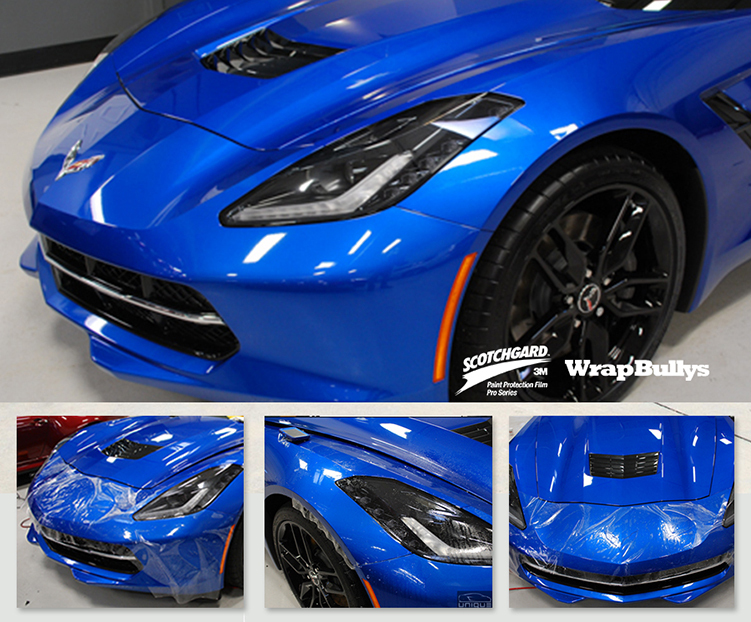 Protect the beauty of your vehicle with Clear Bra Paint Protection. Because things can get ugly out there. Paint Protection Films helps preserve the quality of your vehicle’s finish, can enhance the resale value and keeps your vehicle looking newer longer. No matter what you call it – clear bra, bumper cover, protective film or car bra – Paint Protection Film or is the clear choice to protect your vehicle from scratches, stains, chips and road tar. Your vehicle’s finish is put to the test by the road, parking lot, garage, weather and everyday use. Why not keep it looking great as long as you can? Paint Protection Film is simply the ultimate in paint protection. An exceptionally tough, ultra-clear urethane film, this advanced paint protection technology blends in almost invisibly with your vehicle’s finish. Yet it offers unrivaled protection from almost anything the outside world can throw at it. • The only officially licensed paint protection film of NASCAR®— tough enough to protect vehicles going 185 mph! • Trained, certified installers make sure your new film is installed correctly for maximum visual appeal and unrivaled protection. • Trusted and chosen by new car manufacturers all over the world. 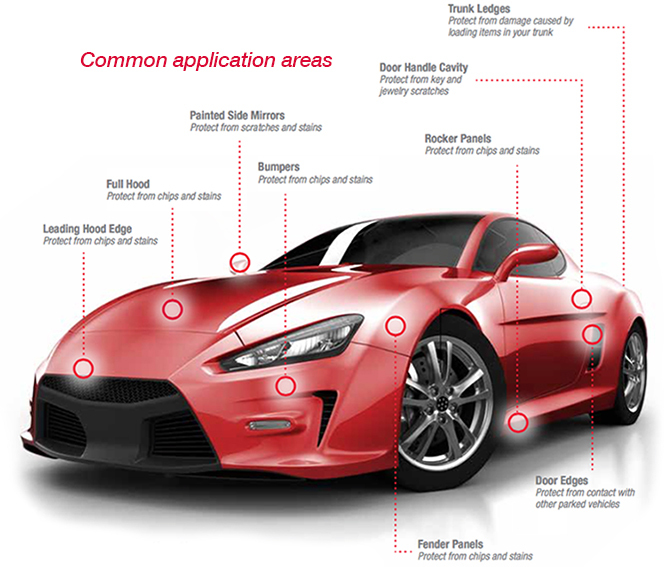 Anywhere your vehicle is exposed to damaging elements – that’s the ideal place to install Paint Protection Film. • Installed using patterns customized to your vehicle for a perfect fit. • Provides industry leading scratch and stain resistance along with exceptional clarity. • Self healing technology helps keep your film looking newer longer. Virtually nothing can protect your vehicle better from scratches, stains and chips than Paint Protection Films. It’s truly the ultimate protection for paint. Paint Protection Film (Clear Bra): Is a removable thermoplastic urethane film that is applied to the leading painted surfaces of a car. In order to protect the paint from rock chips, bug splatter and minor abrasions. Generally 6 to 8 mils thick. Pre-Cut Install: Is clear bra film that has been computer cut using a Graphtec Plotter with Xpel DAP software. Each kit is cut specific to your vehicle make, model, and year. Pre-Cut film with only wrap some edges. trimmed by our expert technicians to wrap every possible edge. This provides the maximum protection and aesthetics of your vehicle. Warranties: We offer a life time warranty for the installation. While the film manufacturers: Xpel and Suntek offers a 10 year and 5 year warranty. Warranties are against yellowing, fading, cracking, bubbling, and peeling. We also offer Xpel Stealth and Suntek Matte paint protection films. To transform your vehicle from a gloss finish to satin/matte finish.